The most comprehensive resource on this explorer's paradise, The High Sierra details all the major and minor routes to the area and covers approach roads, trails, and cross-country and climbing routes. 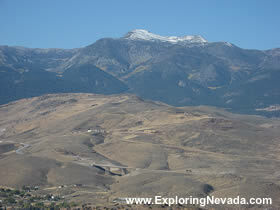 The Virginia City Scenic drive is a twenty mile long paved route that runs between Reno and US Highway 50. Along the way, the route passes through the historic town of Virginia City and climbs over a small mountain range that provides excellent views of Reno, the Washoe Valley and the Sierras. The Virginia City Scenic Drive begins just to the south of Reno, at the junction of Highway 395 and Nevada State Highway 341, which is also known as the “Comstock Highway.” To begin the drive, take Highway 341 to the east, toward Virginia City. For the first few miles, the drive is generic, as it passes by the outer-ring of development in southern Reno. But after two miles, the route begins to climb steeply up the mountains. Numerous scenic pull-outs provide excellent places to park and take in the wonderful views of the Washoe Valley, the 10,776 foot Mt. Rose, the 9800 foot Slide Peak (home to the Mt. Rose Ski Area), and the City of Reno. After eight miles and a gain of 2800 feet in elevation from the drives beginning, the Virginia City Scenic Drive reaches Geiger Summit, which has an elevation of 6789 feet and is the highest point of the drive. From here, the route drops gently down, passing by numerous old mines and mining scars (mining tailings are everywhere in the hills above and below the road) on its way to Virginia City. As the drive reaches Virginia City, the speed limit drops to twenty miles-per-hour. Since Virginia City is a popular, and very nice, historic tourist town, traffic in town is usually moderate to heavy (particularly on the weekends). Those with extra time in their schedule should definitely plan to spend a few hours poking around the historic shops and exhibits in town. After the scenic drive leaves Virginia City, the drive stops following Highway 341 (which turns into a truck bypass around a steep hill) and starts to follow Nevada Highway 342, which leads down a steep hill into the historic little town of Silver City. 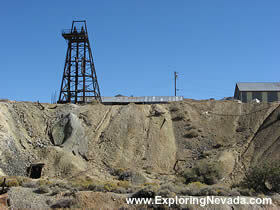 Similar to Virginia City, numerous mines (some more recent) and mining tailings are everywhere, leaving no doubt about what drove the development in this part of Nevada. Beyond Silver City, the route passes through the high desert for a few miles before reaching the terminus of the drive at the junction with US Highway 50. Carson City is just a few miles away to the west, while Dayton lies five miles away to the east. Traffic on the Virginia City Scenic Drive varies between moderate to heavy. During a normal weekday, the drive will have moderate amounts of traffic. However, on the weekends – especially during the summer months or when special events happen in Reno – the traffic on the road to Virginia City can be very heavy. The Virginia City Scenic Drive passes through a checkerboard mix of private and BLM lands, not all of which are easily identifiable. Although there are no designated campgrounds along the road, primitive camping and overnight parking is allowed on the BLM lands. However, for those who plan to camp, pay extra attention to land ownership, as around Virginia City land ownership can be a confusing to determine at times. Generally, following the side roads off the scenic drive for a mile or two will lead to BLM lands, as most of the private property tends to be located close to Highway 341 itself. Overall, the Virginia City Scenic Drive is an easy to reach scenic route that is open year-round and has the benefit of leading to a great little tourist town that offers many activities and attractions. Anyone visiting Reno, or simply passing through it, should allow for an hour or two to see this unique and scenic part of Nevada. Trip Length : 20 miles, one-way. The route follows NV Highways 341 and 342 in-between Reno (to the north) and US Highway 50 (to the south). RV's / Campers? - Yes, but the road is steep and curvy as it leaves Reno. Services Available - Gas and supplies can be found in Reno and Virginia City, as well as in nearby Carson City. General Location - Western Nevada, just to the southeast of Reno and a few miles to the east of Carson City. Camping - There is no dedicated campgrounds along the scenic drive. However, the route does pass through BLM lands for part of the drive, allowing for primitive camping. Hotels, vacation condos and other lodging are plentiful down in Reno and in Carson City.